Martin Luther King, Jr. led black voters from Selma to Montgomery in an effort to register, facing opposition and violence along the way. 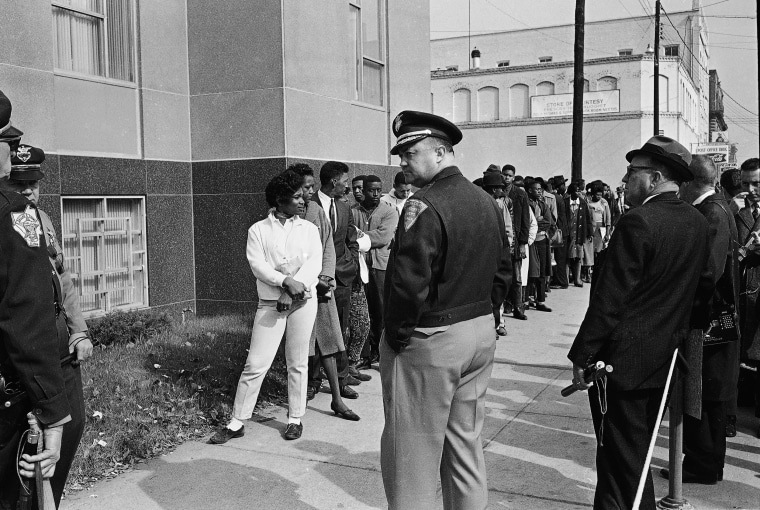 Sheriff Jim Clark, Dallas County Selma, Alabama, stands in front of a group of African-Americans lined up at a side door of the Dallas County Court House in Selma on Jan. 21, 1965, as they drive to boost their voting strength from the present 300 to a 15,000 maximum and face arrest in the process. Sheriff Clark and his posse men have become a symbol of resistance to the African-American community, with clubs and electric cattle prods. The African-Americans have been arrested by Clark, when they refuse to use an alley entrance to the court house. Police frisk one of six African-Americans arrested as they tried to get in the voter registration line in Selma on Jan. 26. After the first 100 African-Americans lined up police would not permit any others to line up in accordance with a court order. Sign-carrying young African-Americans sing and chant as they stage a demonstration at the courthouse in Selma on Feb. 5, protesting voter registration. More than 400 of them were arrested and marched off to a compound. 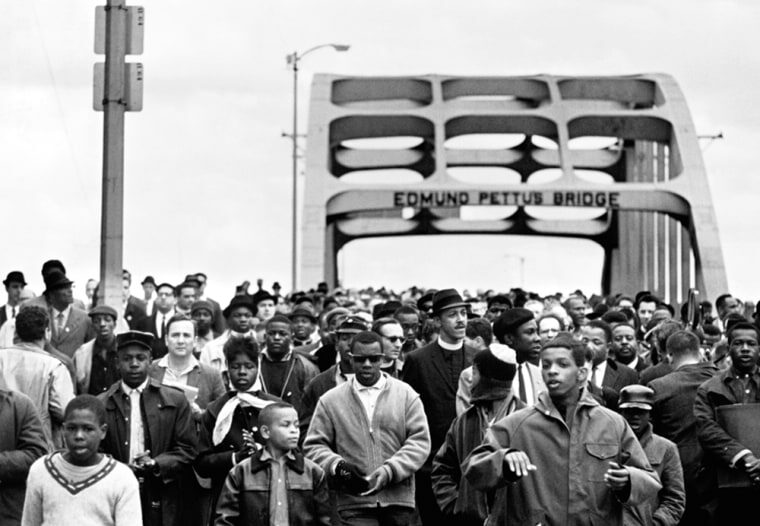 Civil rights activists march across the Edmund Pettus Bridge in Selma, on March 7, on their way to Montgomery, the state capital. They're demanding voter registration rights for blacks, who are discouraged and many times threatened with violence if they try to vote, particularly in small towns in the South. Tear gas fills the air as state troopers, on orders from Gov. George Wallace, break up the march. 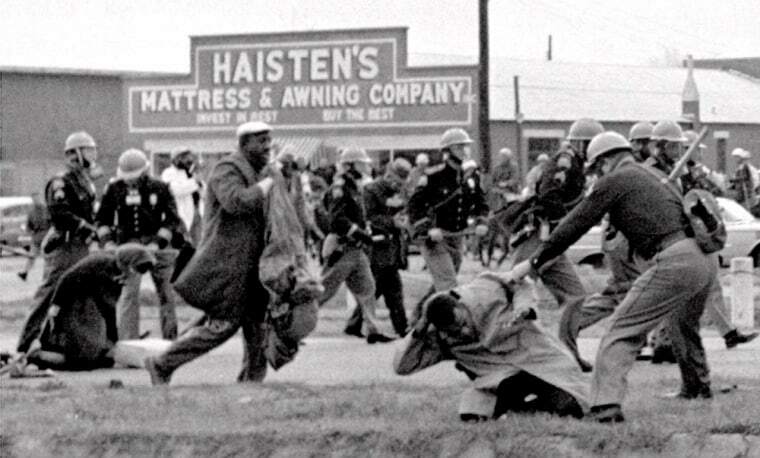 March 7 becomes known as Bloody Sunday after state troopers assault the marchers with clubs and whips. A shocked nation watches the police brutality on television and demands that Washington intervene and protect voter registration rights for blacks. 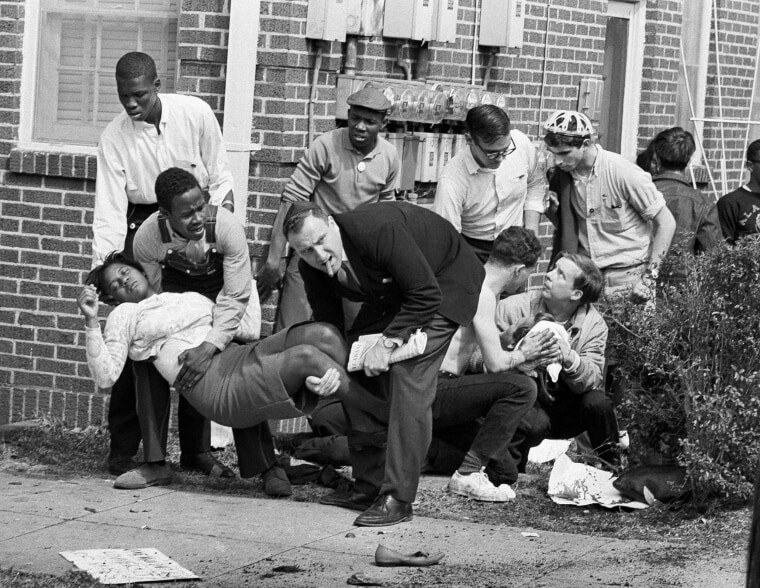 Amelia Boynton is carried and another injured man tended to after they were injured when state police broke up a demonstration march in Selma on March 7. Boynton, wife of a real estate and insurance man, has been a leader in civil rights efforts. 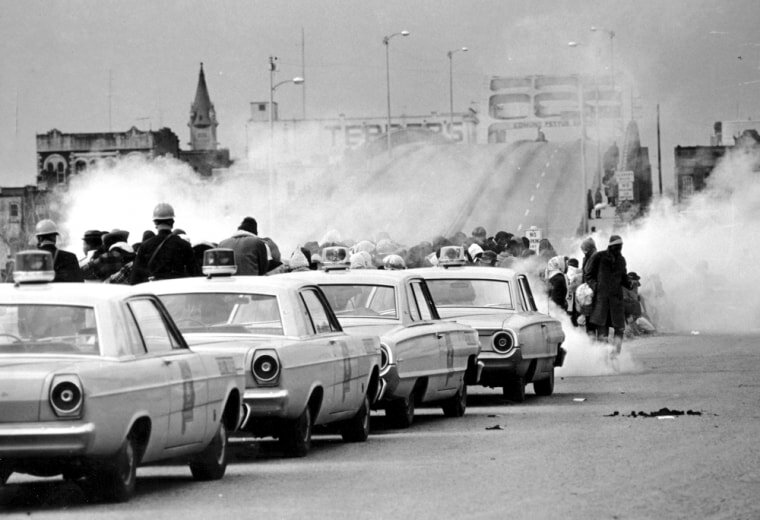 Alabama state troopers swing nightsticks to break up a civil rights voting march in Selma on March 7. 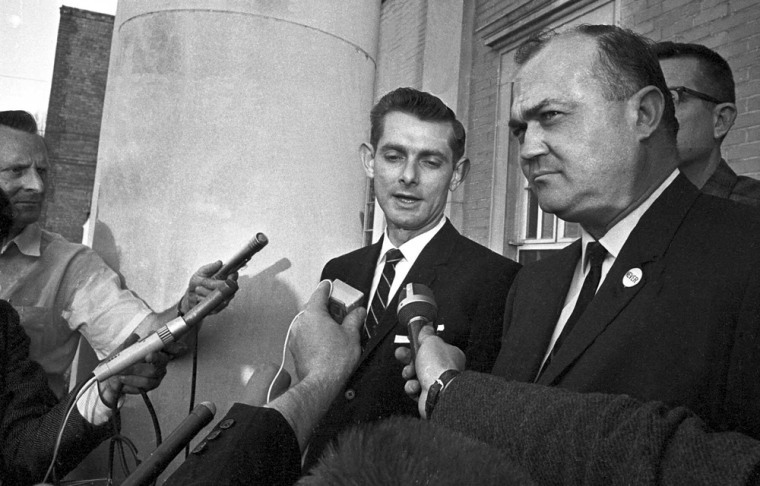 Wilson Baker, left, Selma's public safety director, and Mayor Joe Smitherman, right, tell reporters why they are banning a march to the courthouse, as protesters gather in a nearby church on March 10. Smitherman said tensions were too high to permit the eight-block march. 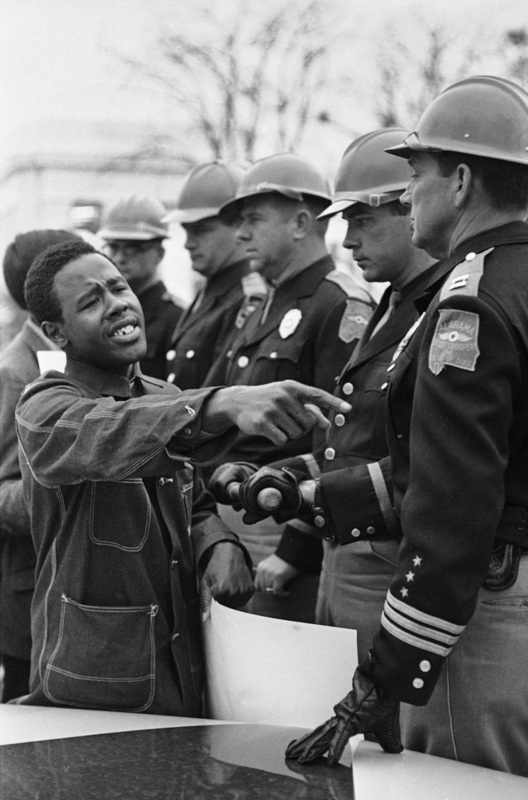 Willie Ricks pleads with Alabama State Troopers to permit him and other voters rights demonstrators to picket on the sidewalk of the state capitol in Montgomery on March 19. The troopers refused. 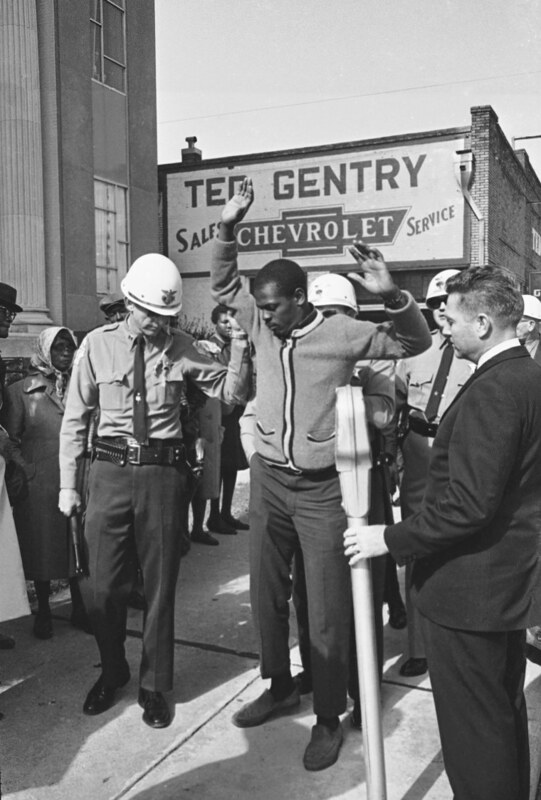 The demonstrators were arrested later by Montgomery city police. No violence occurred. 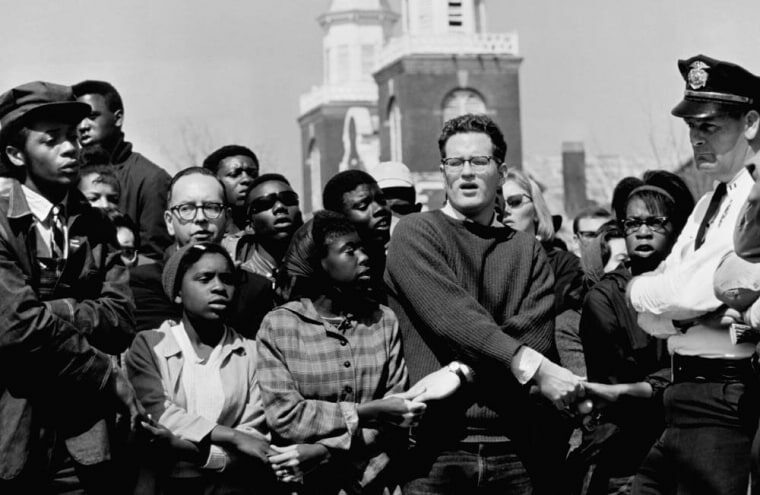 Voting rights activists clasp hands at a rally before starting the third and final march from Selma to Montgomery, on March 21. 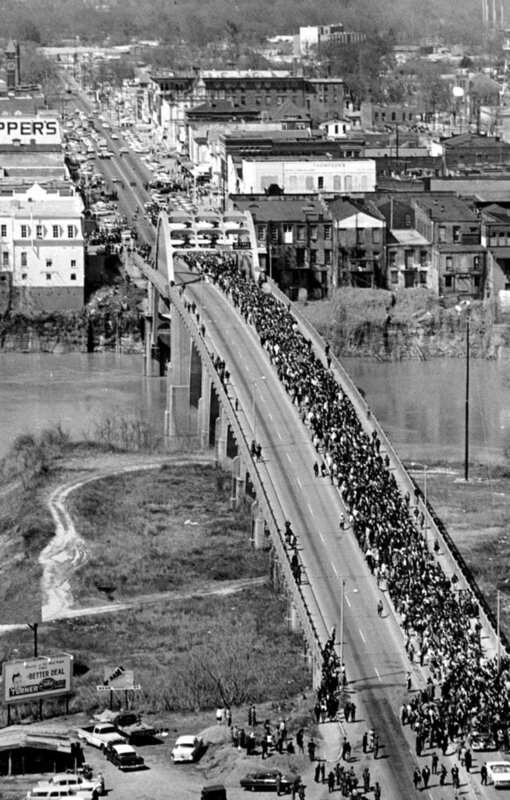 Marchers cross the Alabama River on the Edmund Pettus Bridge in Selma on March 21, led by Dr. Martin Luther King Jr. on the start of a five-day, 50-mile march to the state Capitol in Montgomery. The Rev. 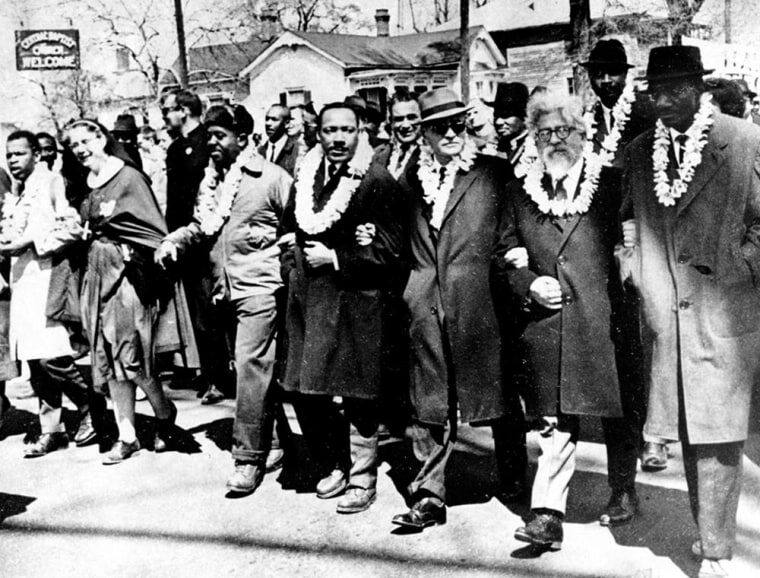 Martin Luther King Jr. links arms with other civil rights leaders as they set off from Selma on March 21. 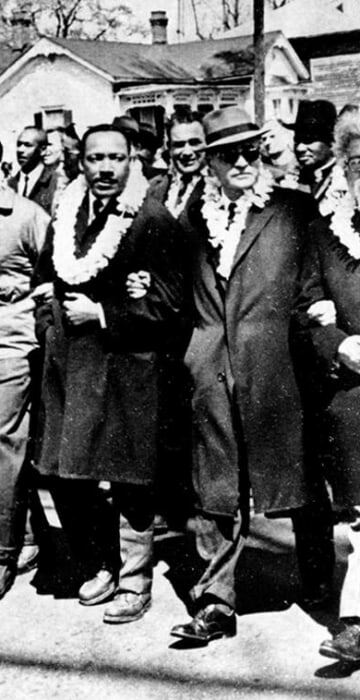 King is fourth from right, and Dr. Ralph Bunche, undersecretary of the United Nations, is third from right. They are wearing leis given to them by a Hawaiian group. 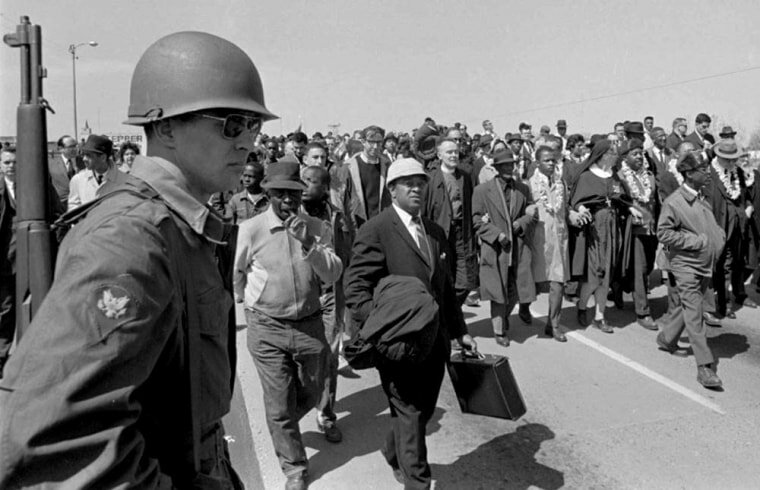 A soldier stands guard in Selma on March 21, on orders from President Johnson to protect the marchers. 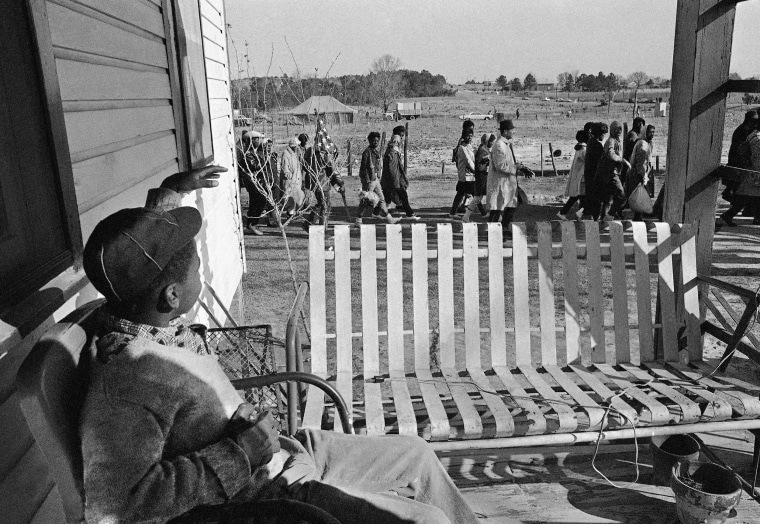 A boy waves from a porch as marchers led by Dr. Martin Luther King leave their camp near Selma on March 22, to resume their voters rights protest march headed to the state capitol in Montgomery. 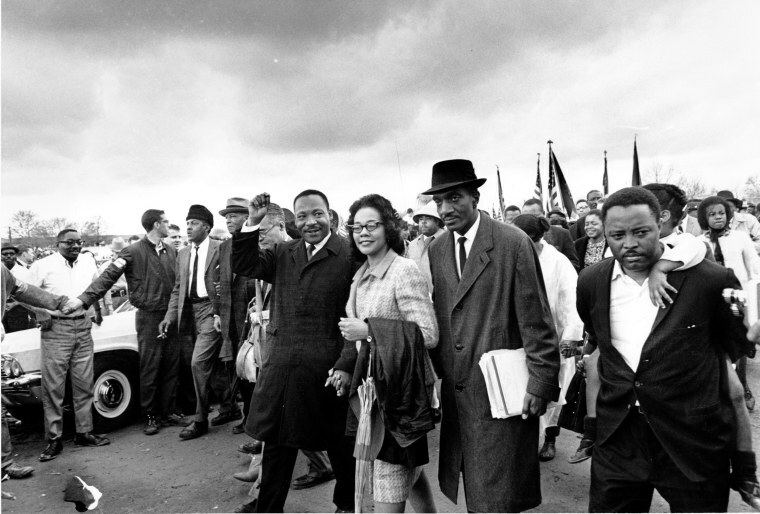 Dr. Martin Luther King Jr., and his wife, Coretta Scott King, lead off the final lap to the state capitol on March 25 in Montgomery. 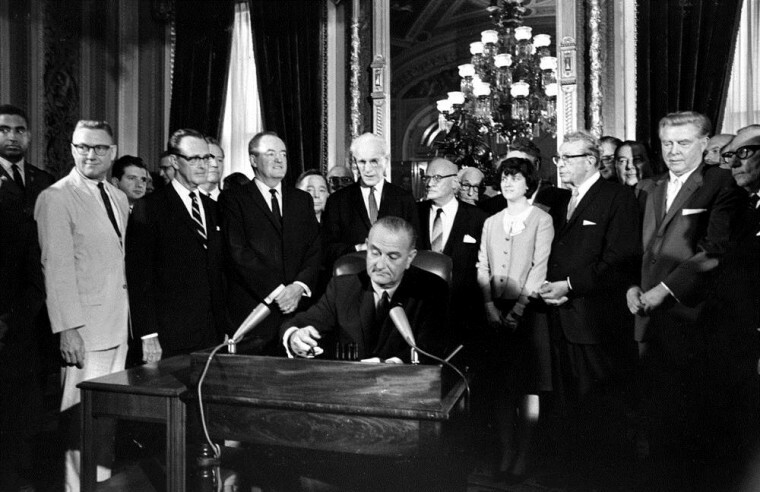 President Johnson signs the Voting Rights Act on Aug. 6. 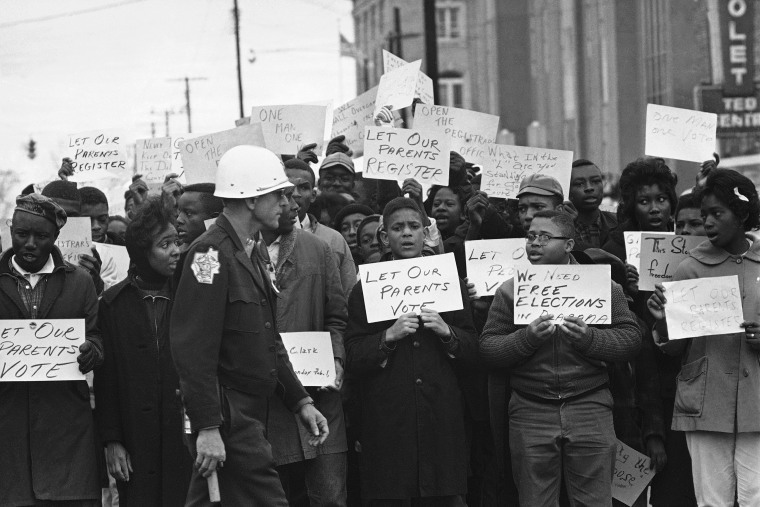 Widely considered the most effective civil rights legislation ever in the United States, the law bans discriminatory tactics such as literacy tests aimed at preventing blacks from voting.